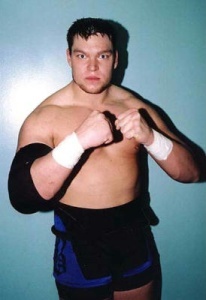 Other Names: Brad Bradley, Bradley Jay(DSW), Jay Bradley(FCW), "Monster of the Midway", "Superbrat"
- IWA Mid-South 6-Hour Marathon (July 4, '03) = Brad Bradley & Ryan Boz defeated JV Insanity & Yellow Jacket. Later on, Bradley fell to Cody O'Neill. - CHIKARA Tag World Grand Prix '03 (July 5) = Team Midwest (Bradley & Jimmy Jacobs) lost in the first round of the Tag World Grand Prix Tournament to the eventual winners, The Night Shift (Blind Rage & Hallowicked). - CZW Aftermath (August 9, '03) = Bradley lost to the CZW Heavyweight Champion, the Messiah. - IWA Mid-South Ted Petty Invitational Tournament '03, Day 1 (November 7) = Bradley was beaten by Nigel McGuinness. - IWA Mid-South Ted Petty Invitational Tournament '03, Day 2 (November 8) = Bradley & Ryan Boz won over Nate Webb & JC Bailey. - IWA Mid-South Christmas Carnage (December 27, '03) = Bradley & Ryan Boz were taken down by Ian Rotten & Steve Stone. - IWA Mid-South Put Up Or Shut Up (January 17, '04) = Bradley & Ryan Boz won a "Falls Count Anywhere" Match over Ian Rotten & Steve Stone. - NWA-TNA PPV (Show #79, February 4, '04) = In a dark match, Bradley, Ryan Boz, & a teammate lost to 3 Live Kru (BG James, Ron Killings, & Konnan). - PWG 88 Miles Per Hour! (March 7, '04) = Bradley fell to American Dragon. - CZW Face Off (April 30, '04) = Bradley won a "Fatal Fourway" Match over Chris Hero, Jimmy Rave, and Alex Shelley. - CZW Apocalypse (May 1, '04) = Bradley lost an "Xtreme Strong Styles Tournament" Match to BJ Whitmer. B-Boy eventually won the tournament. - IWA Mid-South Ted Petty Invitational Tournament 2004, Day 2 (September 18) = Bradley & Ryan Boz lost the IWA Tag-Team Titles, losing a "Triple Threat" Match to Eddie Kingston & Black Jack Marciano. Tank & Iceberg were the other participants. - IWA Mid-South It's Clobbering Time (June 17, '05) = Bradley defeated Eric Priest. - IWA Mid-South No Blood, No Guts, No Glory (July 2, '05) = Bradley & Trik Davis won over Ace Rockwell & Shaun Tempers. - PWG Reason For The Season (July 10, '04) = Bradley fell to Puma. - PWG The Secret Of The Ooze (August 14, '04) = Bradley & Babi Slymm took down Apollo Khan & Brandon Thomaselli. - PWG The Next Show (September 4, '04) = Bradley & Babi Slymm defeated Human Tornado & Supa Badd. - IWA Mid-South Ted Petty Invitational Tournament '05, Day 1 (September 23) = Bradley beat Tank. - IWA Mid-South Ted Petty Invitational Tournament '05, Day 2 (September 24) = Bradley fell to Kevin Steen. - DSW Tag-Team Title Tournament (May '06) = Bradley Jay & Cocky Siaki lost to the eventual winners, High Impact. - DSW Six Flags Park Slam '06 (August 11) = Bradley Jay was beaten by Freakin' Deacon. 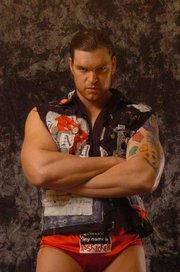 - DSW Six Flags Park Slam '06 (September 9) = Bradley Jay retained the DSW Heavyweight Title, taking down Tony Santorelli. - DSW Six Flags Park Slam '07 (March 17) = Bradley Jay won a "Grudge" Match over Roughhouse O'Reilly. - OVW Summer Sizzler Series '07 (June 1) = Jay Bradley won the vacated OVW Heavyweight Title, winning a "Three Way" Match over Paul Birchall and Idol Stevens. - OVW Summer Sizzler Series '07 (June 8) = Bradley, as the OVW Heavyweight Champion, won a "Non-Title" Match over Jake Hager. 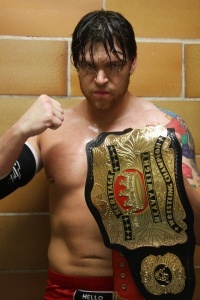 - OVW Summer Sizzler Series '07 (June 15) = Bradley retained the OVW Heavyweight Title, beating Idol Stevens. 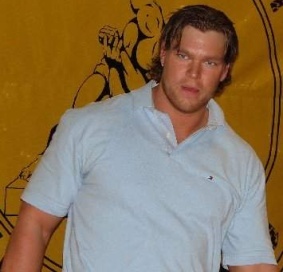 - OVW Summer Sizzler Series '07 (June 22) = Bradley stayed the OVW Heavyweight Champ, winning a "Three-Way No Disqualification" Match over Paul Birchall and Idol Stevens. Due to getting the win, Bradley also won Birchall's house and Stevens' car. - OVW Summer Sizzler Series '07 (June 29) = Bradley took down Chet the Jett. - OVW Summer Sizzler Series '07 (July 6) = Bradley was forced to submit to CM Punk. - RoH Hate: Chapter II (July 23, '10) = In a dark match, Bradley, Jordan McEntyre, & Mark Sterling fell to Brandon Espinoza, Ace Hawkins, & Mike Sydal. - RoH Salvation (July 24, '10) = In a dark match, Bradley defeated Mike Sydal (who was injured during the contest).